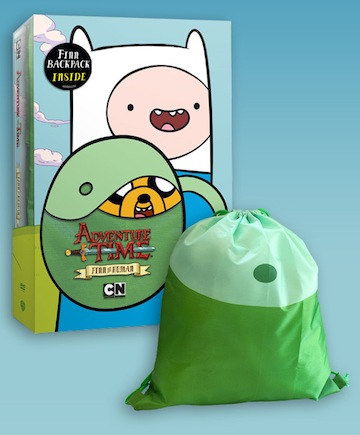 A Totally Mathematical FINN BACKPACK Bundled with an All-New DVD from Cartoon Network! This Christmas, Santa’s got a brand new bag—courtesy of Cartoon Network! Following the huge success of the Jake vs. Me-Mow and Jake the Dad DVDs and accompanying Finn and Jake hats, fans of Cartoon Network’s smash hit series, Adventure Time, can now complete their Finn look with an authentic backpack, which is valued at around 20 bucks on its own, packaged with the DVD! Packed with 16 hilarious episodes from fan-favorite seasons, Adventure Time: Finn the Human is a must-have gift for any Adventure Time lover. Beginning November 25, 2014, for only $24.98, fans will be able to get their hands on nearly three hours of content and a sweet exclusive backpack, perfect for any adventure this holiday season. Adventure Time: Finn the Human is the latest DVD release from Cartoon Network, and joins the best-selling—not to mention bonus-filled—Adventure Time seasons 1-4, as well as episodic releases, Adventure Time: Jake the Dad, Adventure Time: Jake vs. Me-Mow, Adventure Time: My Two Favorite People and Adventure Time: It Came From the Nightosphere, all of which are currently available at retail. These DVDs join a robust line of consumer products, including toys, apparel, accessories, comic books, costumes, posters, youth electronics, posters, publishing and much more.